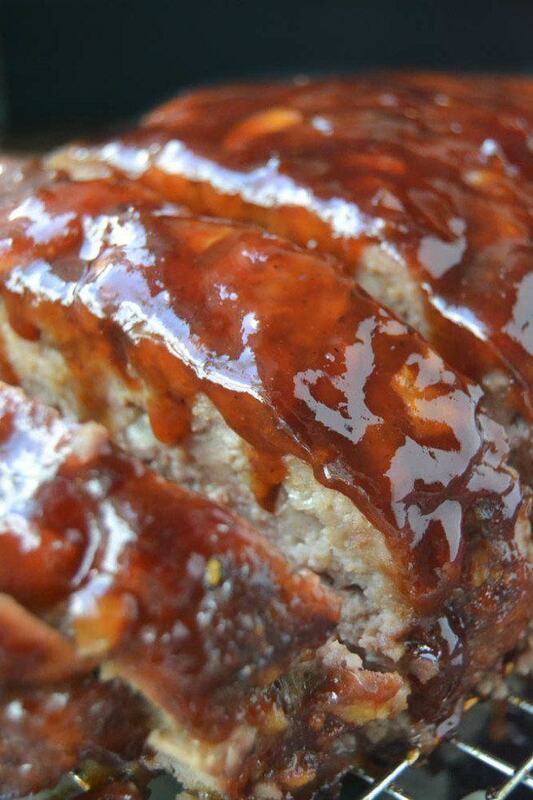 Bourbon Glazed Meatloaf ~ a tender meatloaf drenched in a sweet 'n spicy bourbon whisky glaze ~ definitely not your mother's meatloaf! To make the sauce, put all the ingredients in a sauce pan and stir to combine. Bring to a boil lower the heat and simmer/boil gently, uncovered, for about 10 minutes until thickened. If you used a chunky jam you may want to use an immersion blender to puree the glaze. Put the meats in a large mixing bowl, breaking them apart into small pieces as you add them. Add the egg, breadcrumbs, onion and salt and pepper to the bowl. Mix everything well with your fingertips. You want to thoroughly incorporate all the elements without over-doing it. Form the meat into a loaf, not too tall and not too wide. You want it to cook evenly, so try to get it even from end to end. You can set it directly in a pan or on a baking sheet, or set it on a rack if you have one. Whatever you do, be sure to line the pan with foil since the glaze will drip and make a mess. Spread a layer of glaze all over the meatloaf and bake it for about 60 minutes, or until a thermometer inserted in the center reads 160F. I baste another layer of sauce on the meat halfway through the cooking. Remove the meat and let it rest for a few minutes before slicing. Slather on a final coat of glaze just before serving, (heat it up on the stove so it is hot) and serve extra sauce on the side.